The setting was one of the great pleasures of playing with The Viper and His Famous Orchestra this past Sunday, July 12, at the Great Performers of Illinois 2009 festival in Chicago. 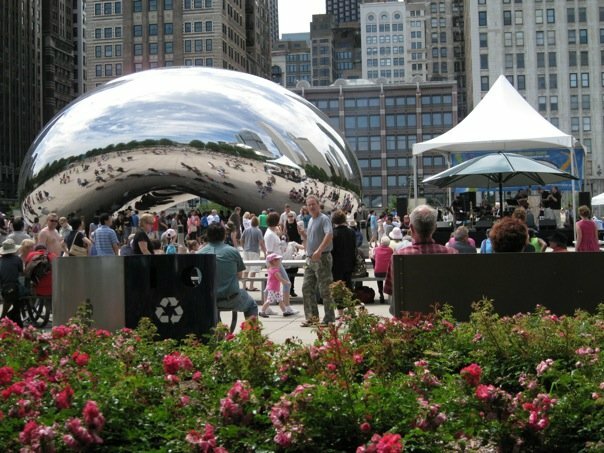 The festival was held in Millennium Park, and our stage was right next to the Cloud Gate sculpture by Anish Kapoor more familiarly known as the “bean.” (That’s us playing to the right of it in the picture above.) Just beyond the bean was Jaume Plensa’s Crown Fountain in which my daughter, Kip Rainey’s daughter, and daughters and sons everywhere could play when they got bored with us. Behind us was Michigan Avenue and the Chicago skyline. And in front of us was Dan Peterman’s 100-ft.-long bench and picnic table, which proved indispensable to getting a crowd to hand around while we played. The picture above was posted to Facebook by Erica Mueller O’Donoghue. More photos to follow.